This week marks the return of a recurring post on this blog- a weekly handy abstract of the reviews in this weeks New York Times Book Review. These are always the newest, the most critically acclaimed and anticipated- and the newspapers reviewers are usually frank and unsparing in criticism, and enthusiastic in praise. If you can’t make it to the paper every week, a glance here might persuade you to check out these books from your library instead of shelling out $20 or more at the bookstore! The sequel to Elizabeth Gilbert’s wildly popular Eat, Pray, Love receives front-page treatment by Curtis Sittenfeld (author of Prep and American Wife). 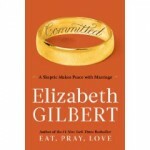 Committed is Gilbert’s account of her marriage of love and convenience- after an agreeable arrangement with her Brazilian partner falls apart courtesy of US immigration law, the author must decide to re-commit to an institution that she is mistrustful of (for good reason). The reviewer thoroughly enjoyed the book- although had difficulties with Gilbert’s asides into analysis of the socio-historical construction of marriage, which gave the book a “neither fish nor fowl quality”. Unfinished Desires, the new novel by Gail Godwin is a “reserved yet powerful” story set in a Catholic boarding school in North Carolina, in which the former Mother Superior recounts a “richer, darker, uninhibited story” of single tempestuous year of toxic playground politics amongst 9th grade girls. In non-fiction reviews, Wayne Biddle’s Dark Side of the Moon is “a deeply skeptical account of the early life and career of Wernher von Braun”, which explores the scientist’s successful escape from judgment for his collaboration with and support of Nazi war crimes. 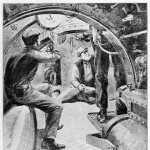 Wired Magazine reminds us that Jan. 11th is the birthday of Popular Mechanics, which was first published in 1902, and remains popular more than a century later. UPDATE: And on a related note: Popular Science recently announced that it’s entire archive- 137 years worth- is available online for free (click here). It works great on an iPhone, too. Here is a sample result set for my search for “Flying Car”, which returned full-color and text issues from the 1920’s to 2004 with articles on the topic. I still think that the future has not officially arrived until I get my flying car! !